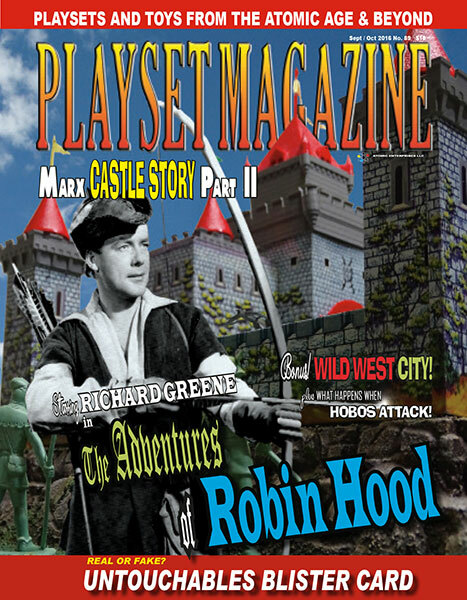 Playset magazine is on the trucks and on its way to you folks for this, our eighty-ninth issue! As the Marx Castle story continues in one of our classic multi-issue explorations of the history and sets of Louis Marx & Co., this issue we feature a refreshed and refreshing look at a TV classic set. Richard Greene was already an accomplished English actor with a large and loyal following when he took on the character of Robin Hood. Only the Winston Churchill story could have endeared him more to the British public. The Adventures of Robin Hood was a huge hit and soared in the ratings and hearts of its audience. Little did we know the show was, behind the scenes, produced and written by a top-echelon staff of Americans, some with a famous and perfectly unsavory past. The names are mind-boggling but really explain why Robin Hood was so good and why it caught the attention of the World’s Largest toy maker, Louis Marx. We’ll go to Sherwood together to explore all the nooks, crannies and details, using a great deal of imagery, about the set that Louis Marx developed to represent the show to kids. His plans included an all-new castle, brighter and more reflective of the English countryside than his earlier “Medieval Castle Fort” which he now left in the past. All new figures and horses accompany this set, but the stellar improvement is a complete set of figures representing the cast. Here at PM we had a blast exploring this terrific set, but it’s not our work you’ll be enjoying. Jim Clouse contributed some extraordinary photos of his own, and we are proud to present them here. Filled with very cool Marx conversions is Greg Liska’s story on his conscripting a Western Town figure to The battle line. Also here are several stories of golden merit – the Untouchables blister Card set gets legitimate factory documentation here, an outstanding photo feature on the sprawling Wild West City, and the chilling (do you dare look! No! Look away, it’s too awful! ) When Hobos Attack, Mike Poko’s tongue-in-cheek Halloween contribution; and Joseph Svec contributes his Attack at Port Royal diorama. It’s going to be a great time having you here for this one folks, and we hope you enjoy this romp in Merry Olde England and other “parts unknown” ! 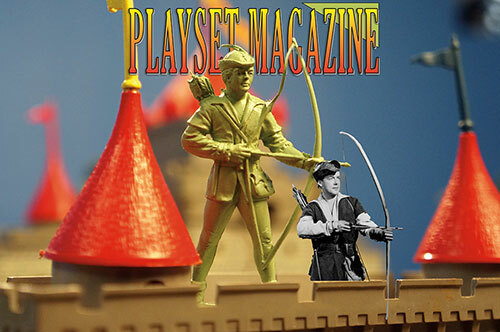 We are busily preparing for the great Chicago Toy Show (referred to often as OTS, the Old Toy Soldier Show). We are sure to see many of you there, and please take a moment to drop in to our show room on the fifth floor, just off the elevators. We expect to be open the majority of the time to serve any needs you may have or just to chat in the surroundings of that great toy extravaganza. Thanks for being here, see you “there”, for some really Great Hunting!